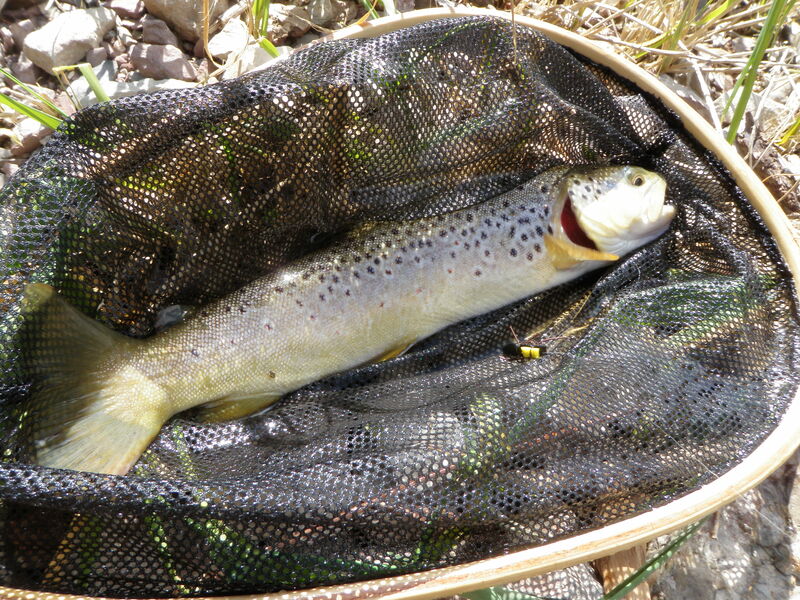 I’d read articles about the great fishing in Elk Creek, a tributary of the Conejos so I gave some thought to exploring that water, but with the level of success experienced on Thursday, why not return? That’s what I decided to do, but I didn’t need to drive to the store and thus got a nice early start. I was at the bridge by 9AM with my Camelback full and my lunch packed. I tied my raincoat around my waist under my waders to leave room in the backpack for a sandwich and other goodies and set out on my hike. I planned to hike further and stay up high above the trees and vegetation above the stream and hike for 30 minutes. This worked out rather well and put me downstream even further than where I’d begun on Thursday. Unfortunately when I filled my Camelback the small rubber gasket in the cap had come out, and apparently I didn’t seat it properly, and 75% of my water supply leaked from the bladder. This was not a good start to a hot sunny day. For some reason I decided to start with a tan Charlie Boy hopper on Friday morning. To the hopper I added a purple PT, and began fishing. Two things had changed from the previous day; there were far fewer clouds in the sky thus creating warmer air temperatures and the water level had dropped. I later checked and flows dropped from 170 to 150 between Thursday and Friday. This allowed easier wading, but the fishing became more difficult. Things started off reasonably well as I landed two browns on the Charlie Boy hopper, but all the deer hair wing fell out upon landing the second fish. I switched to a yellow Letort hopper and added a copper john and landed a very nice brown on the copper john and then a smaller brown on the Letort hopper. But the hopper wasn’t producing consistently and I experienced quite a few momentary hookups where the fish got off. Even though I got an early start, I didn’t seem to be able to get in the same kind of rhythm as I’d enjoyed on Thursday, so I decided to break for lunch on a nice grassy bank and observe the water. As I munched my lunch I noticed some PMD’s and the occasional huge fluttering green drake and a few golden stoneflies as well as yellow sallies. 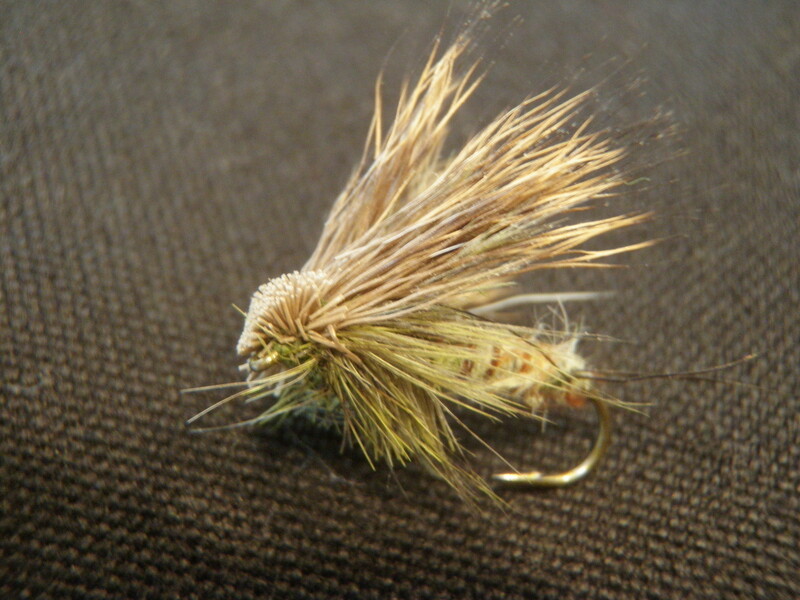 After lunch I decided to try the bushy green drakes I’d bought at the fly shop. 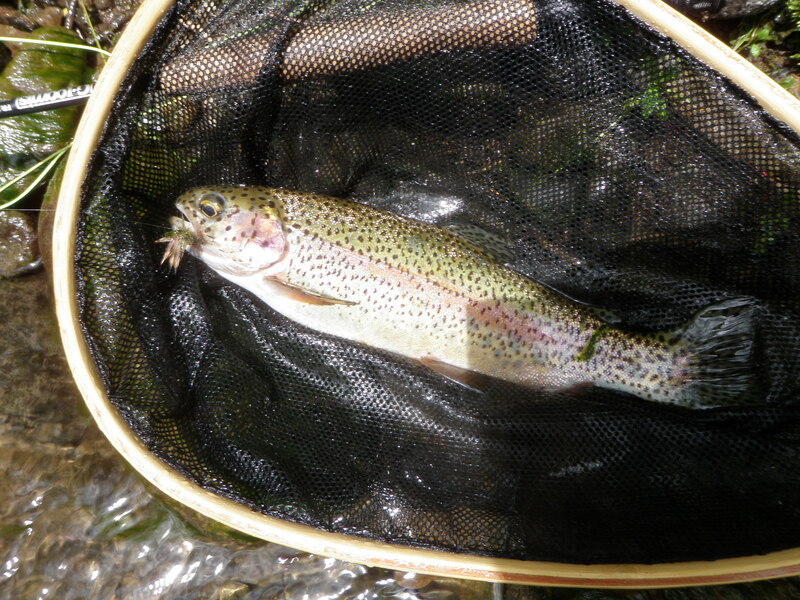 This proved to be a great decision and for the next 1.5 hours I experienced hot action and landed 11 trout including one brightly colored rainbow. 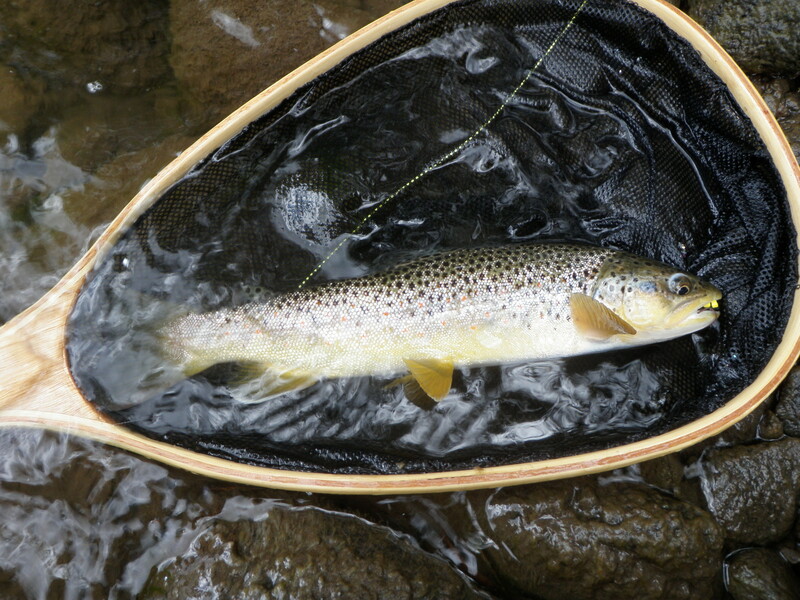 The trout loved the bushy green drake and took it with confidence in the deeper runs and pockets. I was stuck on 15 when the trout seemed to turn off on the green drake as the sun beat down and the temperature soared. I still hadn’t reached my starting point from the previous day when I encountered a place where a large dead fallen tree stretched on an angle from the bank out into the river and then right above the tree there was a high vertical rock wall. The current rushed down my side of the river and then swept along the vertical rock wall before creating a small pool above the fallen tree. I clung to the rock wall and tossed a Chernobyl into the point where the currents formed a small V where the downstream current and the one along the rock wall merged. Suddenly a huge mouth appeared and gulped the Chernobyl and made the sound of a loud burp. I’d never heard anything like this before. 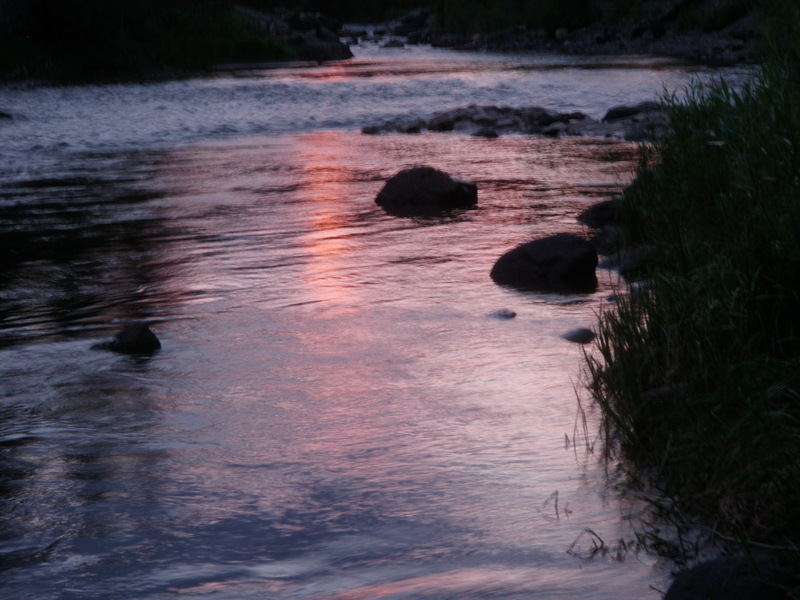 I set the hook and the brown charged downstream by me in the heavier current and then leaped from the water. I could see it was a nice-sized brown. Once it splashed back down in the water it shot directly toward the fallen tree and its many protruding branches. If it got among those branches it was game over. I applied steady pressure but couldn’t turn it, and in fact the trout accelerated and it was game over. My line flew back toward me, and I screamed some not so nice words in exasperation. Fairly soon after this exciting encounter, I reached the water I’d covered the previous day. I fished my way up to the nice pool where I’d been for the hatch and tried deep nymphing it again. Once again I foul hooked a nice brown. Judging from its size and location, it may have been the same fish I foul hooked yesterday. I decided to skip the rest of the water I’d covered before and hiked back to the parking lot with the intent of sampling the river above the bridge. As I was walking down the road from the parking lot to the bridge another fisherman was driving up the road and rolled his window down to greet me and ask how I’d done. I ended up chatting with Steve from Albuquerque, and he suggested I take a look at the meadows section that he said was three miles further up the road. By now it was 4PM and I found a nice run of moderate depth north of the bridge and cast my Chernobyl ant and suddenly a fish rose and slurped it in. I fought the hot fish and brought a nice 14 inch rainbow to net. Unfortunately as I was positioning for a photo, it made a spurt from the net and broke off my purple PT dropper and that was my last one of the smaller size. I continued moving upstream and jumping in to fish nice water. I replaced the purple PT with a beadhead PT, a beadhead hares ear, a beadhead bright green caddis pupa, and a beadhead emerald caddis pupa. Along the way I landed a small brown on the Chernobyl ant. Eventually I came upon a nice pocket water stretch across from the Lake Fork Campground. I had a few refusals from what appeared to be a decent brown in a deep slot across from the campground, so I replaced the two flies with a single size 16 caddis with a light gray body and brown hackle. The targeted fish grabbed the caddis when it got sucked under water by the swirling currents and I experienced a momentary hookup. It was now 5PM and I had a decent hike back to the car in the heat so I decided to turn around even though some nice water beckoned ahead. 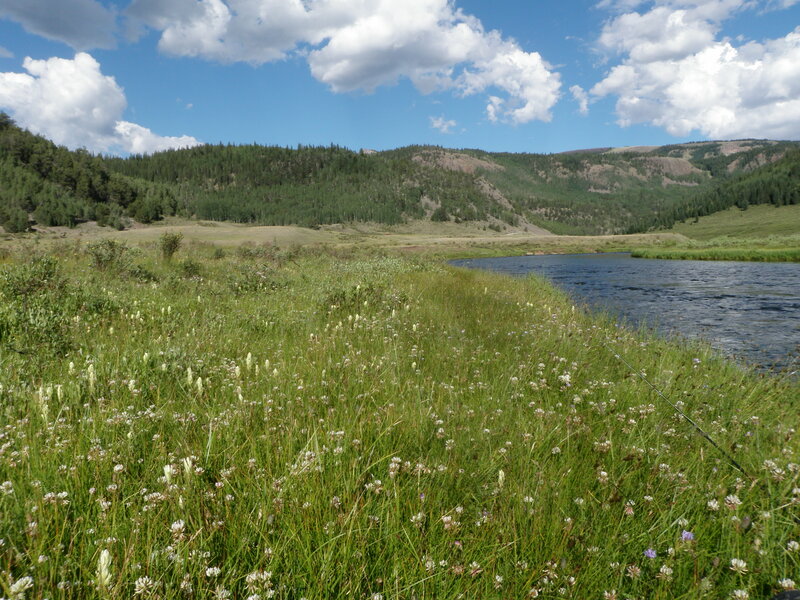 When I got back to the car I debated whether to try the meadow stretch or call it a day. Since I’d come a long way and survived the dirt road, I owed it to myself to check out the meadows. It turned out to be more like four miles, but sure enough it was obvious when I reached the meadows. The stream here was quite wide and consistently 3 to 4 feet deep with occasional protruding boulders to interrupt the monotony of the constant flow. How does one fish water like this when nothing is showing on the surface? I spotted another fisherman so angled upstream of him around 100 yards. I still had the Chernobyl ant with the beadhead emerald caddis pupa dropper, so I started fishing the way I’d learned in Alaska. I shot casts out over the river and made a big first mend to get the fly line above the flies and then fed out line while making quick constant stack mends to maintain a nice drag free drift. In addition I walked along the bank at roughly the same speed as the current. Much to my surprise, after walking perhaps 20 yards of bank doing this and just as my flies were five feet above a protruding rock, the Chernobyl disappeared and I set the hook and played a fish that felt decent for a minute or two before it made a sudden turn and freed itself. Again a few choice words were uttered. I continued moving downstream in this fashion with no further success until I approached the other fisherman and exited and quit for the day. Friday was a good day, but not as good as Thursday, but still far superior than waiting for the flows to subside in northern Colorado. 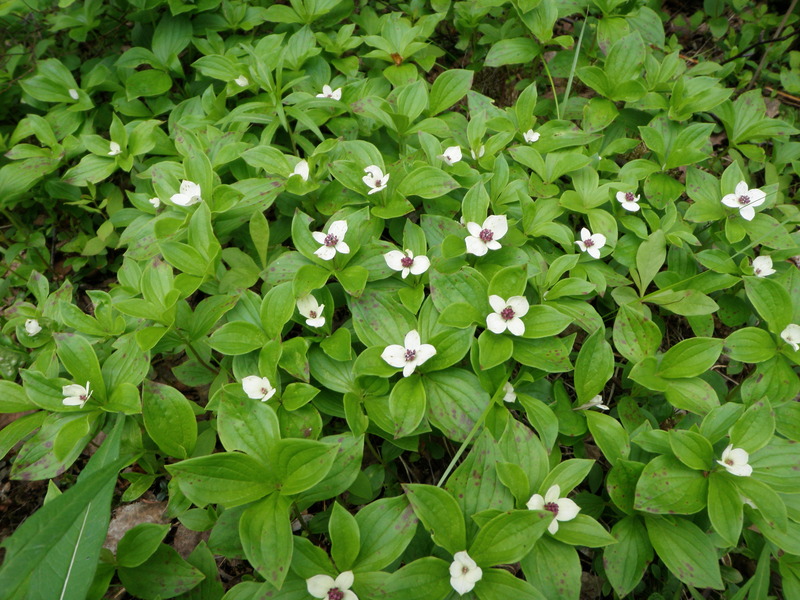 When I awoke on Thursday morning and walked to the picnic table to start the stove and heat up water for tea, I noticed some large brown muddy spots on the tablecloth. The marks were around four inches wide and three inches tall. These were definitely larger than a squirrel or raccoon. What was going on here? I scanned the picnic table, and the water container and stove and dishwashing bin were all there. But something was missing. I remembered that I left the utensil bin on the table as well as it didn’t contain any food. I looked around and discovered a mass of crushed plastic twenty feet away from the table under some tall evergreens. 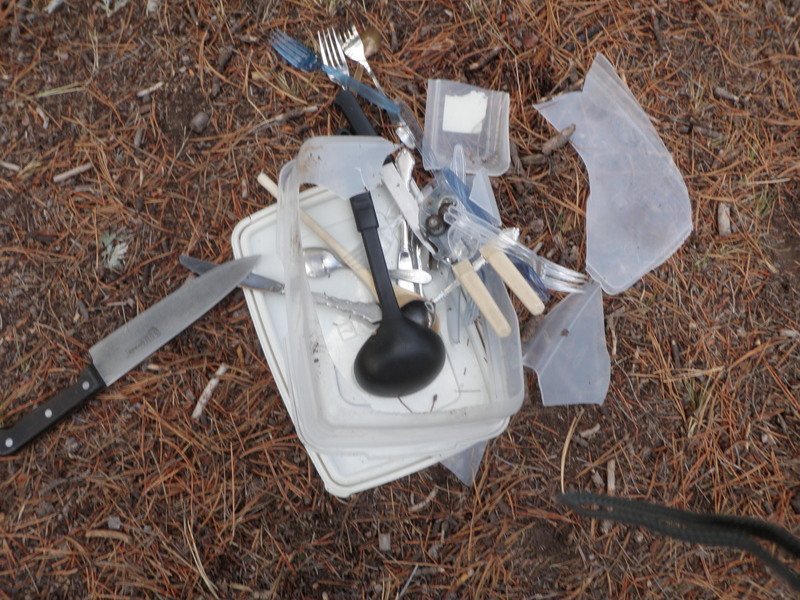 I went over and inspected and found the container had been crushed into many pieces, and my utensils were scattered on the pine needles. I found a garbage bag and gathered up the plastic pieces, and took the utensils back to the table for washing. I decided to dispose of the garbage bag and walked over to the other loop to find the dumpster had been turned upside down. I later learned that the bear had been in camp at around 11:30PM. Apparently the bear had been on my picnic table and smashed my utensil container, and I slept through the entire episode! This is scary stuff. I planned to drive back to the fly shop to buy some supplies and get information. Now I also needed to buy a new container for my utensils. After I prepared breakfast I washed all my utensils and put them in a plastic bag. The closest store was probably in Antonito, so I drove the 22 miles to a small supermarket and bought a new Ziploc container and ice and inquired on the whereabouts of the Cottonwood Meadows Fly Shop I’d read about in my Colorado fly fishing book. The store personnel gave me a brochure and apparently I’d driven by the fly shop and it was now called Conejos River Anglers. I stopped at the fly shop in Mogote and asked the proprietor a bunch of questions. I bought a tapered leader, a spool of tippet, split shot and three thingamabobbers. The gentleman in the shop informed me I had to go high and showed me where to go on the map. It required a 16 mile drive on a dirt road. He then pointed to flies that were known producers, and I bought 10 or so. I bought two bushy green drakes and two parachute green drakes with white wings. I also bought a bunch of nymphs with black beadheads, iridescent purple bodies and fine rubber legs. I bought around six of these in various sizes. I’ll refer to these in future reports as purple rubber leg pheasant tails. I asked when the hatches occurred and the storekeeper told me in the morning. I glanced at my watch and knowing I had a long rough drive on a dirt road, I quickly paid my bill and hustled on. I stopped briefly at the campground to pick up my waders and wading boots and decided to forego preparing lunch and do that when I reached my destination. Sure enough after traveling up route 17 for six miles, I make a right turn on to CO 250 and it was dirt and quite rough with washboard sections from time to time. I couldn’t average more than about 25 MPH. I drove past some beautiful stretches of river and gorgeous countryside. This was remote Colorado at its best. After passing a two mile stretch called the Pinnacles, which I’d read about in the book, I continued another couple miles until I saw route 105 cutting off to the left. I descended this very rough dirt road a short distance and crossed the bridge and parked in a rough rocky sagebrush parking lot. While I was rigging up, two Texans came and asked me which direction I was fishing. I responded that I planned to go downstream, and they asked if I minded if they went upstream. I replied that they should go for it. I stuffed a yogurt, trail mix bar, and some carrots in my backpack along with my Camelback, and I was off down the trail. I wanted to hike a bit and not fish too close to the parking lot, although in retrospect, I don’t think it mattered much. I hiked high above the river on some grassy ridges and then after twenty minutes cut down to the river at a point where the bank was gentler. No sooner had I arrived by the stream and started tying on the parachute green drake with one of the purple PT’s than I spotted another fisherman at the bottom of the pool. I would discover that there were only a handful of fishermen on this river, and I managed to find one of them. As I tied on my flies the other fisherman pressed upstream, so it became clear he wanted the pool, so I backed away from the river and hiked further downstream. I ended up jumping back in just below a second small tributary that entered on my side of the river. 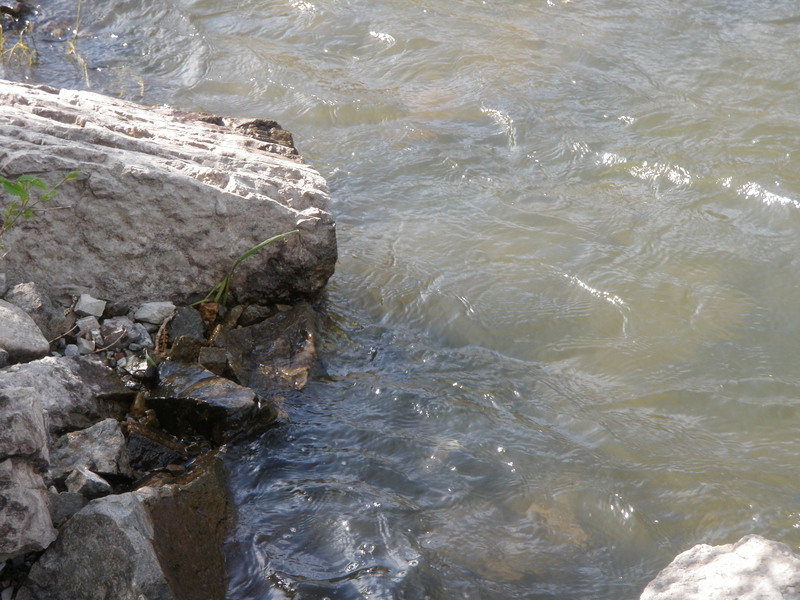 The river was running quite strong from bank to bank, and it was quite difficult to wade upstream against the current. I was forced to fish within three feet or so of the bank as I had done on the Arkansas River on Sunday; however, this was less intimidating since it was a smaller stream. I picked up a fish on the parachute green drake and one on the purple PT, but the top fly began to sink, so I swapped it out for a yellow Letort hopper. 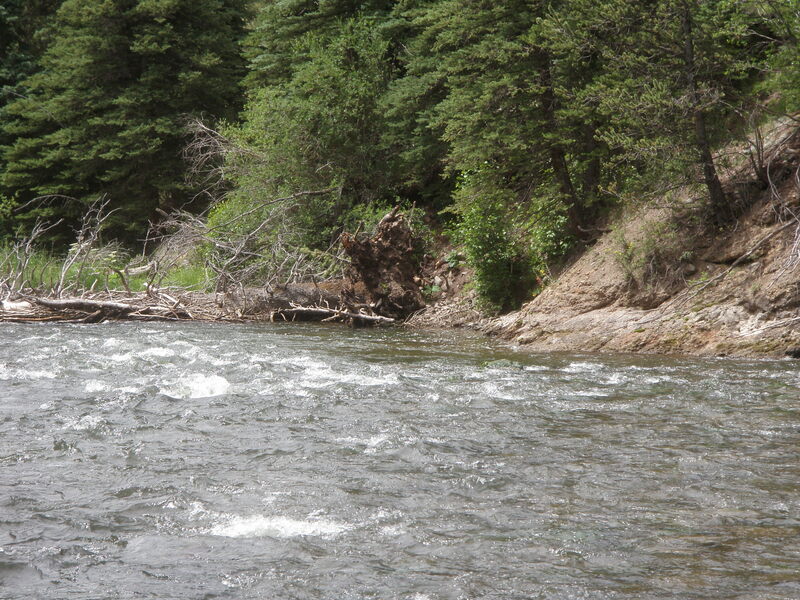 I continued working my way upstream tight against the bank and landed three more trout on the trailing purple PT. I began fishing at around 10:30AM and it was partly cloudy. Dark clouds would roll by periodically and it looked like rain, but it never did more than sprinkle for a short time. At 11:30 a fairly large dark cloud rolled in and this triggered some sparse hatching. I spotted PMD’s and a few green drakes. At about this same time I reached the sweet pool I had originally chanced upon, and my nemesis had moved on. I watched the water from the tail and could see at least four fish rising. I tried my hopper and dropper, but they were focused on something else. Since I saw PMD’s I switched the purple PT out for a normal beadhead pheasant tail, and that didn’t produce either. I moved up to the mid-point of the run so I could observe better and thought I noticed a fish taking a PMD from the surface. I clipped off the two flies and tied on a light gray comparadun aka the money fly. I made quite a few casts with no success but eventually on a drift over the tail of the pool a fish rose and sipped in my fly. I set the hook and eventually landed a nice brown that extended almost the length of my net. As quickly as the hatch had begun, it now ended after an hour or so of intense action. I moved to the top of the run and decided to try the thingamabobber with a pair of nymphs and run them down through the pool and along the current seam. On one of these drifts, the bobber dipped and I set the hook and found myself attached to a fine brown. Unfortunately when I brought it to my net it was foul hooked. Near this spot I sat down on the bank and ate my lunch, but the hatch had pretty much wound down. After lunch I tied on a Chernobyl ant with the purple PT as a dropper. The sky continued to cloud up and then the sun would break through. 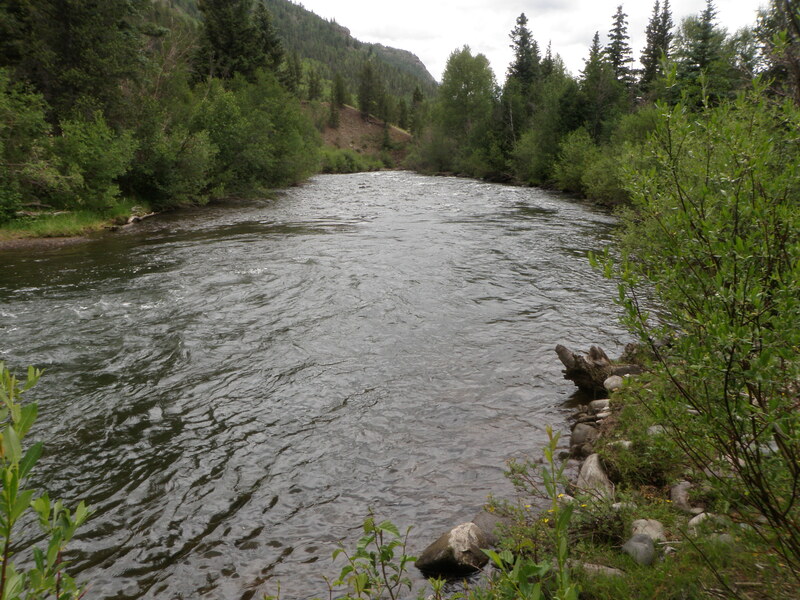 I believe that this combination of overcast conditions and the higher flows really helped the fishing. As I moved up along the left bank facing upstream I continued picking up fish with decent regularity. The Chernobyl and PT were probably working at equal 50-50 levels of success. The current was so strong that in many places I had to exit the stream and jump around trees and willows that were tight to the current. But whenever I found some slack water, it seemed to produce a fish. On the day I landed 30 brown trout and several were quite nice fish for a relatively small stream, although it was probably the size of the Frying Pan, so not quite as small as many streams at this elevation. Toward the end I switched the purple PT for a prince and caught a fish on that, and then removed the prince and replaced with a bright green caddis pupa, and that produced a couple. I needed one more fish to reach 30 when I reached the bridge where the car was parked. I went above the bridge and looked through my fly pocket and spotted a Madam X with a gray body. For some reason I decided to give it a try and it produced number 30. I now had to drive the 16 mile dirt road back to camp, and took my time as I was not in a rush to catch the morning hatch action like the morning drive. On Thursday night I took a hike along the lower level of the campground and snapped some sunset photos. Of course after dinner, I packed everything in the car including the new utensil container. At around 11:15 Thursday night I heard quite a bit of activity and assumed a new camper had arrived. I awoke again at 3AM to the sound of a thud, and I was certain that the bear returned and knocked my camp stove off the table. But when I awoke in the morning and looked out of the tent, the stove and water container where still in the position I’d left them in. I was all caught up at work and waiting for the office manager to finish job costing for June, so I had the rest of the week available to fish. I checked all the likely rivers within a day’s drive of Denver, and all were still running high from the 2011 protracted snow melt. The only day trip option was edge fishing the Arkansas. 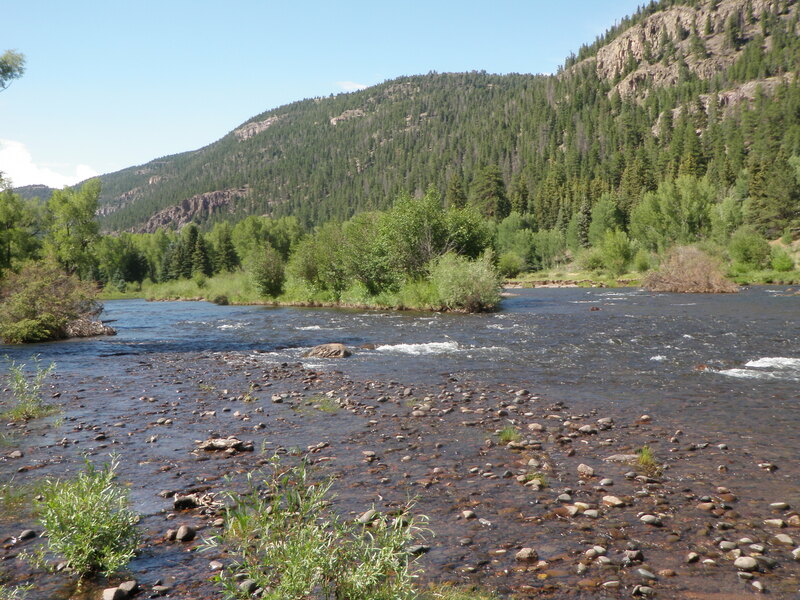 I checked some of the southern drainages and discovered that the Rio Grande and Conejos Rivers in south central Colorado were flowing at ideal levels, so I decided to do a three day camping and fishing trip to the Conejos. Jane and I and the kids had been to this area perhaps 15 years ago when we took a trip on the Combre and Toltec Railroad and camped at Elk Creek, but I hadn’t fished very much. 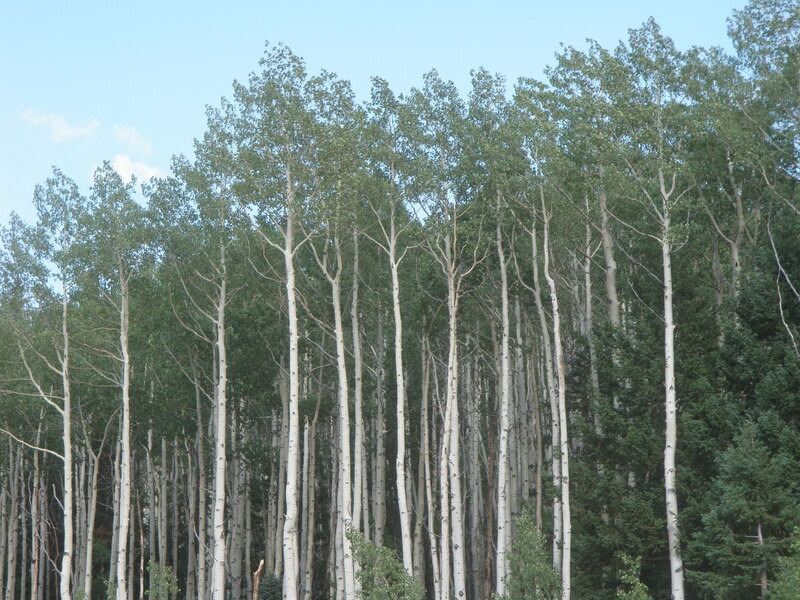 I packed everything up on Wednesday morning and made the 4.5 hour drive to the Aspen Glade Campground along the Conejos River. I arrived at around 3PM and cruised the campground. Quite a few sites were reserved for Friday night, and I wanted to stay Friday and drive back to Denver on Saturday morning. The campground was on two levels and the premium sites were among tall cottonwood trees along the river, and all those sites were either taken or reserved for Friday night, so I defaulted to a nice site among some tall trees on one of the upper level loops. I set up the tent and while doing so the campground hosts stopped by to say hello and warn me that a bear had been in camp the previous two nights. They suggested keeping my key fob in the tent, and should a bear appear, hit the panic button to scare off the bear. I was anxious to hit the river, and it looked clear and ideal so I drove approximately three miles upriver to a pullout with wooden stairs over the fence. The sign said this was private land but special regulation water and fishing by flies and lures allowed. I walked a short distance to a cattle bridge and crossed to the southern side and began fishing with nymphs and a large indicator. I worked my way up a beautiful long deep run with the nymphs, and was amazed that I didn’t have any success. When I got to the top, I tried the stack mend technique and once again was not rewarded. This would continue for essentially the next four hours. The next beautiful spot was a huge deep pool and the grass was beaten down along the edge so obviously fishermen had been there recently. After thoroughly working the seam and run with nymphs, I switched to a large olive-brown articulated streamer and swept that through the pool from top to bottom in the manner I’d learned in Alaska. Again there were no takers. I moved up some more to a spot where the river ran along a dead tree. I switched to a Chernobyl ant and this brought a couple refusals from obviously small fish. I switched to a bushy size 12 caddis and again saw a refusal. Meanwhile I paused to remove my backpack and make my second application of heavy duty DEET. The mosquitoes here were voracious. It was now getting toward dusk, and I had lost confidence and was growing weary so I retreated back toward the cattle bridge while swatting the persistent winged attackers. When I got near the bridge I found a rod tube, the type with a place to store your rod with the reel attached. It didn’t have a name on it, so I took it along with me. I crossed the bridge and walked up along the north bank to a spot where the river split around an island and cast my caddis in some small pockets around protruding rocks. 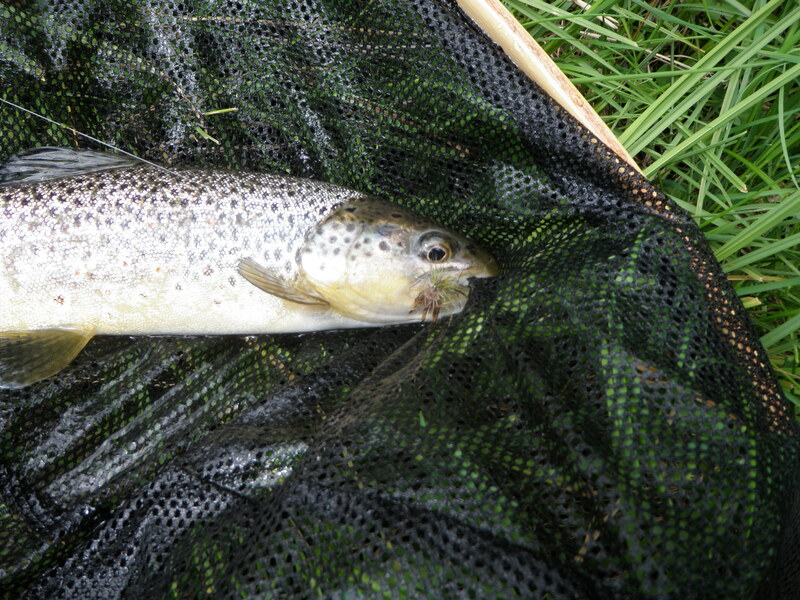 Here I finally landed a small 8 inch brown trout on the caddis. My last attempt was the north side of the long run above the bridge. I converted back to nymphs and thoroughly covered some very sweet fishy water with the nymphs, but once again I was foiled. I quit fishing at 8PM and returned to camp and made dinner using the light from my propane lantern with only a small brown trout and an empty rod tube to show for my efforts. I was now regretting paying for three nights at the campground. Salida was too far to drive from the Alvarado Campground, so I spent Friday setting up camp, mountain biking and hiking the area. 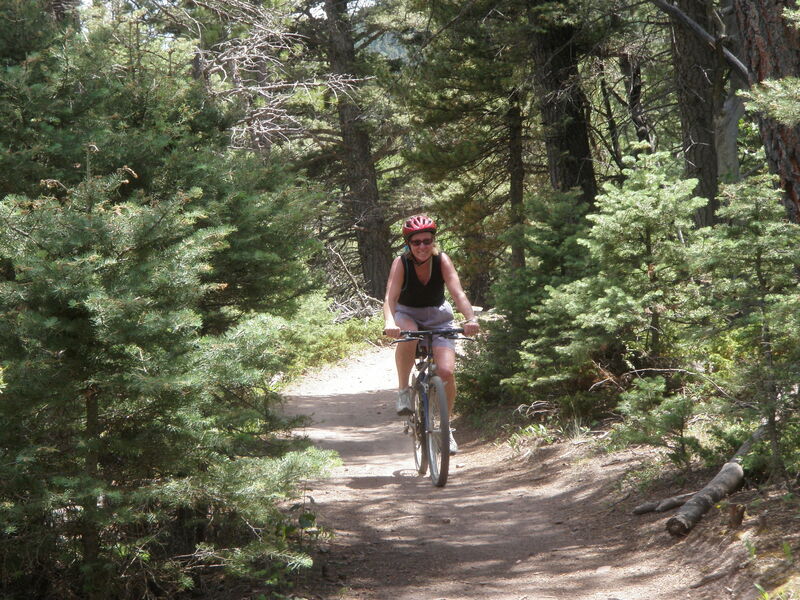 On Saturday Jane arrived and we did another mountain bike ride and then a two hour hike and cooked dinner and enjoyed the beauty of the area. On Sunday after packing up camp, we strolled around Westcliffe and explored the shops and had a tasty lunch on the patio at one of the restaurants. 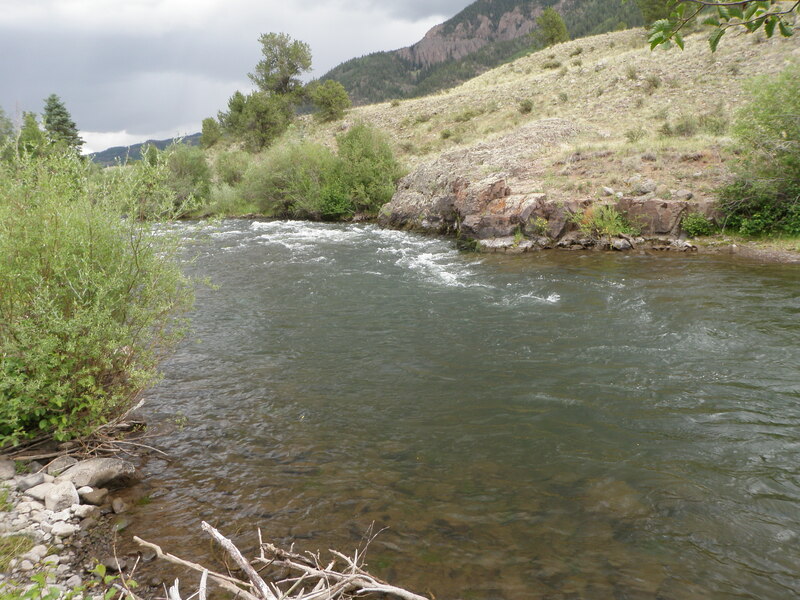 After lunch Jane headed back to Denver and I headed to the Salida area to try edge fishing as recommended by Taylor. I parked at lunch rock just above the Wellsville bridge. It was extremely hot, probably in the mid-90’s so I initially took Taylor’s advice and just wore my shorts and my front pack. I assembled my Sage 4 weight and bounced down the rocks and tied on a yellow Charlie Boy hopper. I worked up the stream for a bit but didn’t have any luck with the Charlie Boy so I switched to the old standby, yellow Letort hopper. 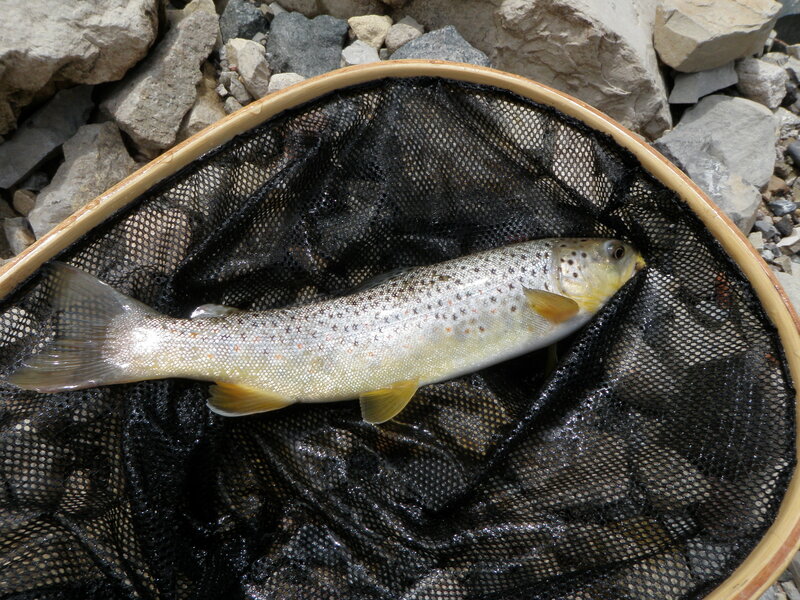 I was just hopping from rock to rock and popping the hopper within three feet of the bank, and in short order I picked up two brown trout and photographed them. After landing the first two I failed to hook one, and then I broke off the hopper on a hook set. The hopper was producing reasonably well, but I decided to try a Chernobyl ant for more buoyancy as my next fly. This produced a third brown, and then from a position six feet above the water on some rocks I hooked and landed a nice rainbow on the Chernobyl. I had to hoist the fish up to my level and then toss it back down. Next I reached an area where the water fanned out and was fairly slow and shallow, but there were a bunch of willows along the edge. Normally I could have walked out on a rocky gravel bar, but I couldn’t get in good position without my waders so I skipped this area. But the going was getting rough because the vegetation was tight to rapid current, and I found myself scrambling up and down the bank to get around these tough access spots. I decided to go back to the car and put on my waders. I moved the car a bit upstream to where I ended my fishing and put on my waders in the 90 degree heat and returned to the river. Next some black clouds rolled in, and I heard some thunder so once again I returned to the car and dug out my raincoat and wrapped it around my waist under the waders. Finally I returned to the river ready to fish and started getting into a rhythm. I wasn’t catching fish in every likely sheltered lie along the bank, but frequently enough to keep me enthusiastic and moving along. 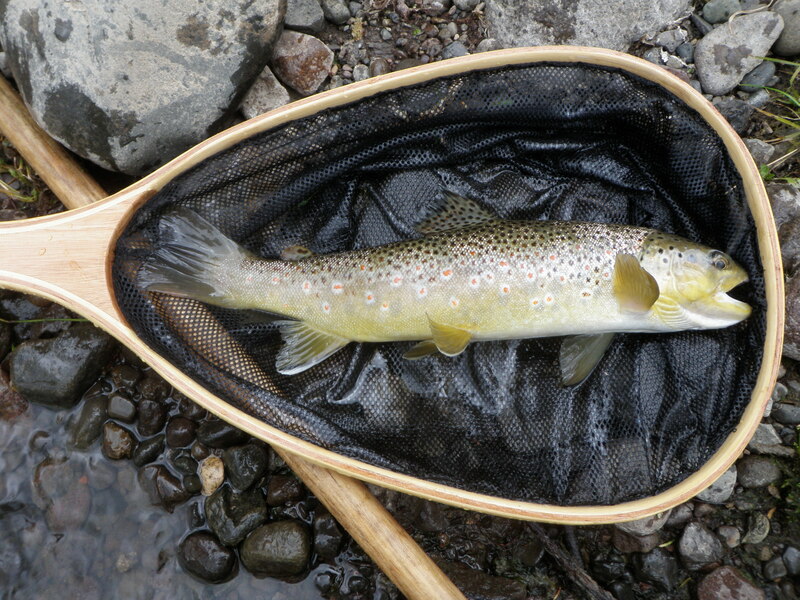 At another point I spotted a very nice brown that appeared to be in excess of 15 inches within a foot of a large rock sticking above the surface. I was careful in my approach, but he didn’t respond to the Chernobyl ant. I added a copper john dropper in hopes the big guy might grab something subsurface, but that didn’t work and the brown disappeared. I left the copper john on as a dropper and kept working up along the bank picking up nice browns along the way. My last fish was a beautiful rainbow that grabbed the copper john. The rainbow charged out into the fast water, and I had to work him up and allow him to run several times before landing. After releasing the rainbow I looked at my watch and it was approaching 5PM, and I still had a 3 hour drive ahead of me and unpacking all the camping gear, so I quit for the day. Having returned from Alaska on Monday, Jane and I were anxious to make a trip to the Colorado mountains, so we decided to hike to Mitchell Lake. We packed our lunches and hiking gear and drove to the Brainard Lake parking lot. We hiked the .5 mile or so to the Mitchell Lake trailhead and then proceeded. Much to our surprise 75% of the trail was covered in snow. 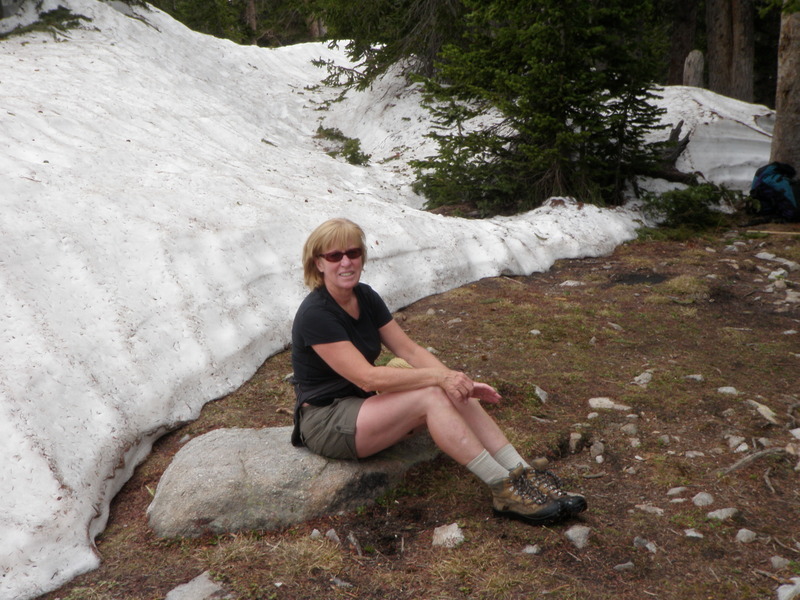 We hiked over numerous snowdrifts and lost the trail many times. We finally reached the lake, and it was ice free. We grabbed one of the few large rocks that wasn’t covered in snow and ate our lunches. Jane made a snow angel and inscribed the date made with sticks in the snow drift next to our lunch rock. After lunch I climbed into my waders and strung my Scott 6 weight and waded into the frigid lake. The low end was quite shallow so I waded along the rocky edge to a point where the small stream enters. 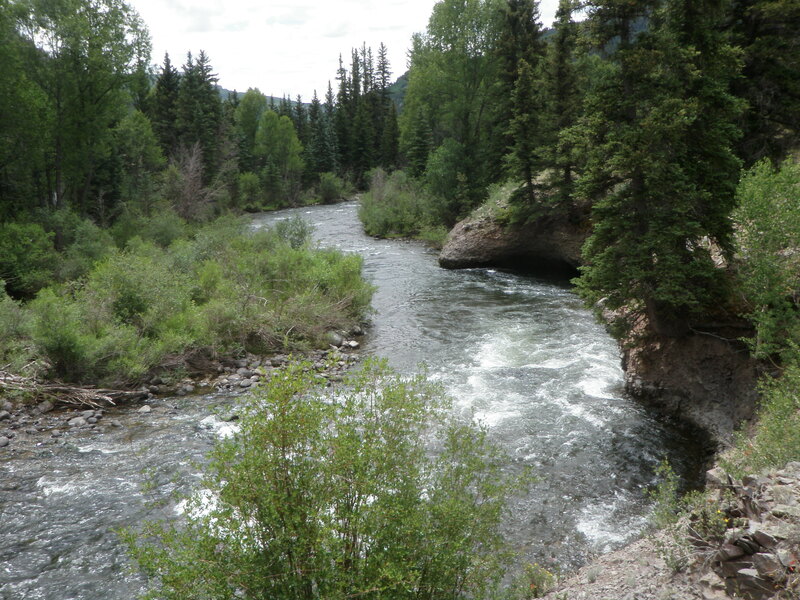 I caught several cutthroats and brook trout at this point two years ago. I made 5-10 casts into the run and swung a woolly bugger with no response when it began to rain. The sky was quite dark and I could hear thunder, so I climbed up on the bank and walked up and down many drifts until I got back to Jane. She was anxious to return to the car, so I left my waders on, and we managed to find the trail in the snow and return to the car. Once I was at the car I decided to try fishing Brainard Lake. I began where the lake was fairly close to the road and began casting the streamer twenty yards out into the lake and stripping it back. I moved westward along the shoreline until I reached the point where a small stream entered the lake. Here I decided to switch to the stack mending technique I learned in Alaska and made numerous nice drifts out into the lake along either side of the current seam. I switched to a beadhead hares ear and beadhead caddis pupa for this approach. I crossed the small stream and moved to the entry point of a slightly larger stream and tried the stack mend technique once again and again it didn’t produce. I didn’t feel like working around the larger stream because it was too swift to cross so I returned to my starting point where Jane was waiting and called it a day. Sunday morning after our usual breakfast we packed our belongings in the Ford Escape and began our return trip to Anchorage. We booked lodging for Sunday night at the Lake Hood Inn near the airport. Lake Hood Inn was the same place I slept on my first night after arriving in Anchorage on June 17, two weeks ago. Since we had a lot of time to make our return trip, we planned to stop in the Kenai Wildlife Area again and do a few more hikes that we’d skipped on the way down the peninsula. On the outskirts of Homer on our way north we spotted a large scenic overlook area and paused for some photographs. 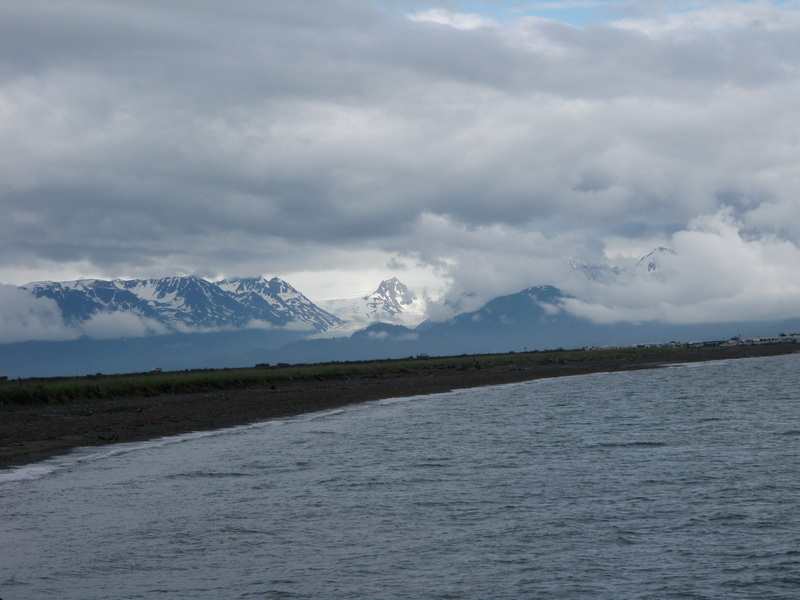 There was a range of mountains to our south across Kachemak Bay and then two large snow-covered peaks to the west across Cook Inlet. The southern most peak to the west was Mt. 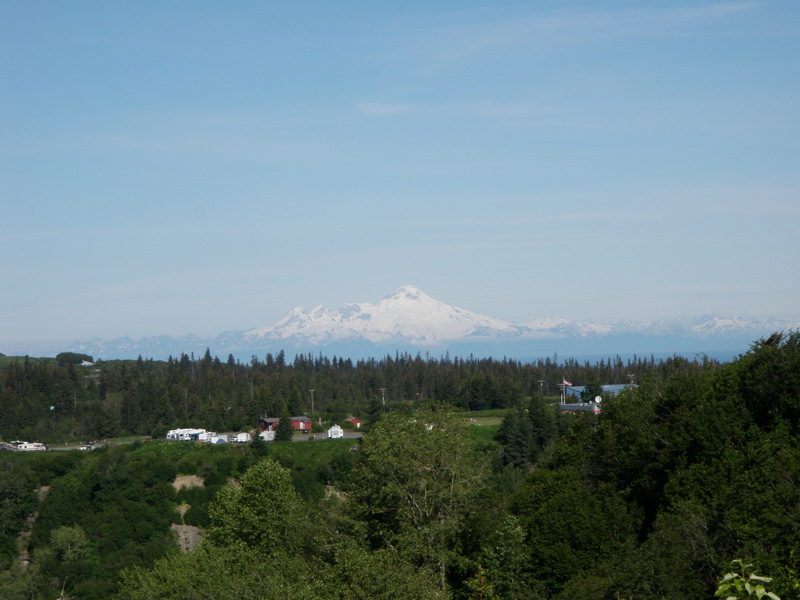 Redoubt, a volcanic peak that erupted in 2010 causing the cancelation of some flights. As I began driving north a huge peak appeared before us. The two peaks we’d seen at the overlook were to our left so this could only have been one mountain…Mt. McKinley. We had a brief opportunity to view McKinley, and it was in fact huge. Jane saw it as well, and we hoped to find a safe pullout to take photos, but it never happened and by the time we reached Anchorage clouds had once again rolled in and obscured any views to the north. We pushed on to Soldotna and then east to the Kenai area. The first hike we’d chosen began in a campground so we drove a short distance and found the trailhead. 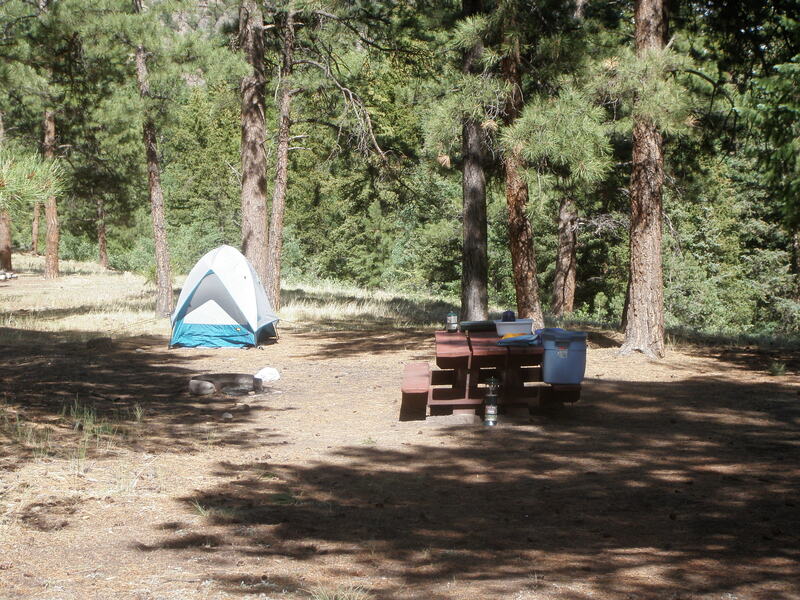 The campground was very nice and appeared to be full for the Fourth of July weekend. 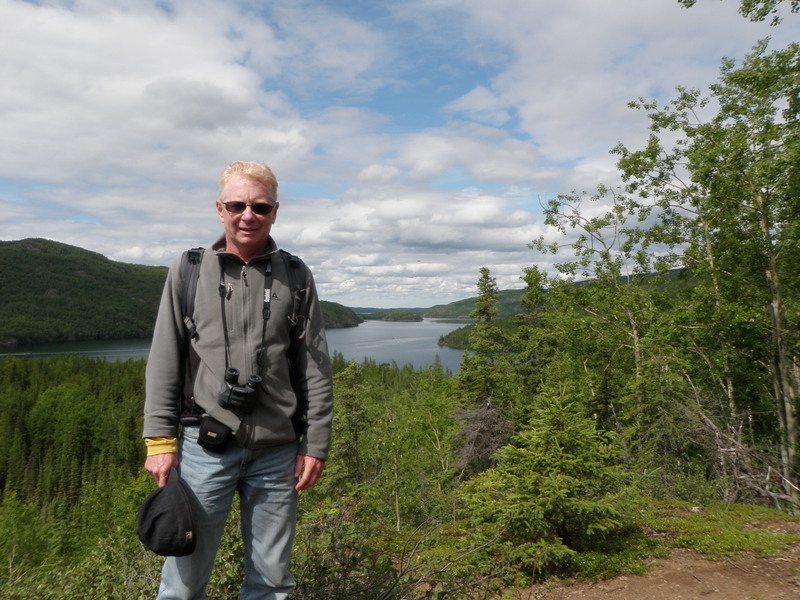 We hiked a couple miles to an overlook where we could see a lake, and then we continued on a bit further to another high spot where we could view Skilak Lake. We retraced our steps and drove to the eastern end of the area, and then went back west for three miles to the West Kenai Canyon trailhead. We’d already done the east trail on our way to Soldotna on Thursday. On this trail we actually got quite close to a channel of the river, and it was just as aqua as it was from high above. By now we were getting quite weary and anxious to get back to Anchorage, AK. We’d had a great time, but thoughts of work and family and Colorado began creeping into our new reality. We found the Lake Hood Inn and were surprised to discover our key was not in an envelope. I called the innkeeper, Bill, and he said to hang tight as the maid was currently getting our room ready. After a brief wait, the maid introduced us to our room which faced the lake. 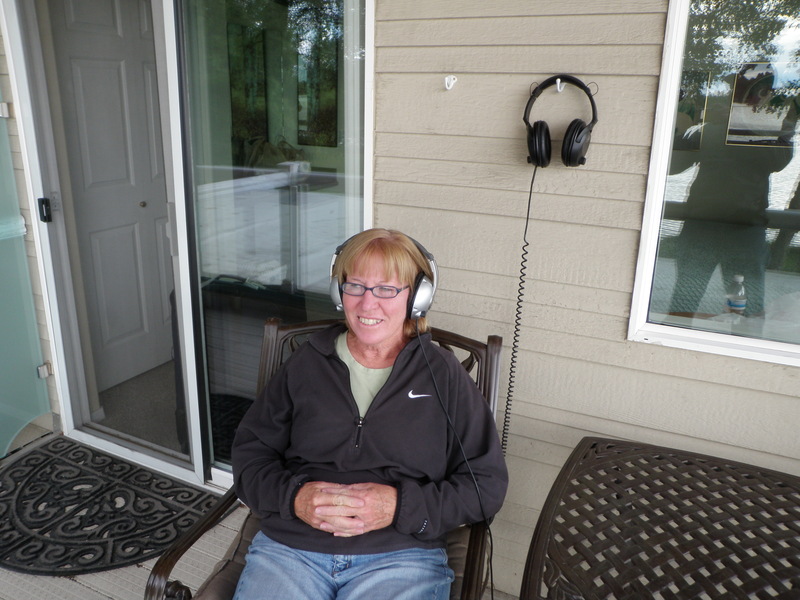 Jane and I sat on the deck listening to the aviator talk while float planes landed continuously on the lake. It was quite a scene. For dinner we drove back to downtown Anchorage and went to the Snow Goose for a second time as Jane wanted to purchase Snow Goose pint glasses for Dan, Kirk and me. Since we had an early flight, we returned the rental car on Sunday night and then took a cab back to the Lake Hood Inn and arranged for a taxi pickup on Monday morning. Everything went according to plan on Monday and we arrived back in Denver in time for fireworks displays. We woke up Saturday morning to a steady light rain in Homer, AK. After our usual tasty breakfast of giant muffins we set off for the Homer spit. This is a narrow extension of land that extends into Kachemak Bay just south of Homer. It contains beaches and numerous boats and cruise ships as well as restaurants, bars and shops. We found a nice convenient parking spot next to a strip of shops and a miniature boardwalk and began browsing the shops in the light rain. We covered nearly every shop and when we returned on the other side of the main street, we saw the Salty Dawg. Taylor and Bill Edrington mentioned this as a must see landmark so I took a photo and then we stepped inside. 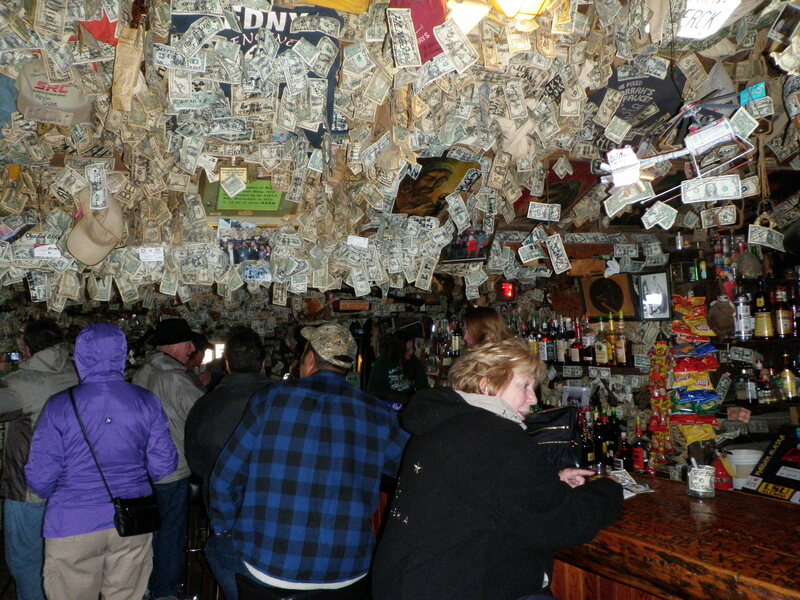 It was a dark musty bar with a low ceiling and dollar bills pinned to every wall and ceiling with individual’s personal signature on the dollar bill. We continued down the road and then found a place where we could stroll the beach. 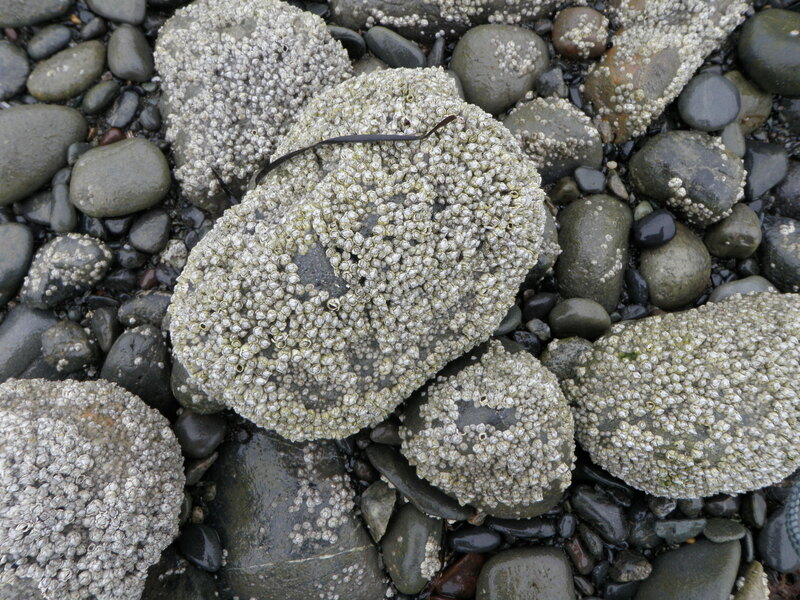 The beach was quite wide with several tidal pools draining back into the main body of water. We walked the beach a bit and then headed back to the road at a point where there were numerous RV’s and tents ready for the holiday weekend. 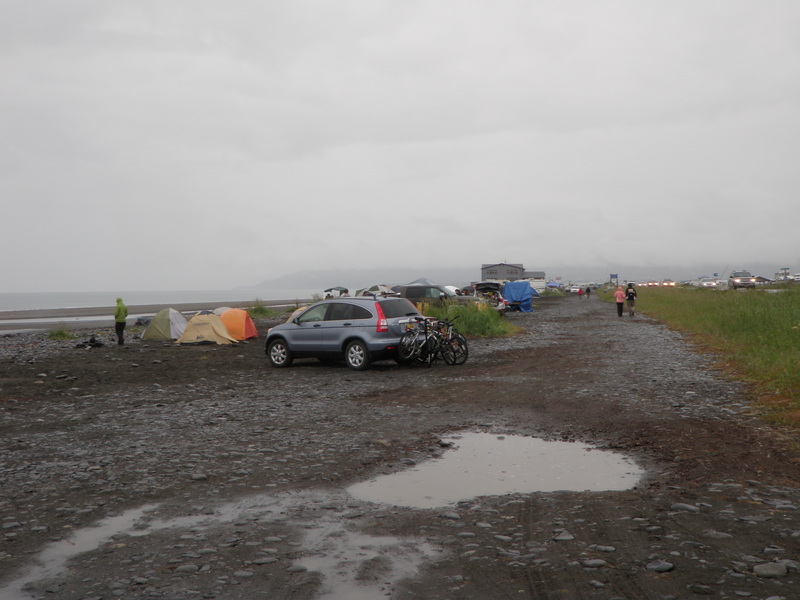 As the steady rain fell the tent campers looked pretty miserable, and I felt sorry for them. We crossed back to the other side of the road and found a seafood place for lunch. We started chatting with our waitress, Mimi, and discovered she was from Vermont, and graduated from George Washington University with a major in aerospace engineering. She was working in Homer for the summer and had worked at Breckenridge for two winters, but her parents wanted her to find a real job. We gave her Brady Young’s number and suggested she call him to network in the aerospace field. Our parking time was up so we left the Homer spit and returned to an area near the maritime wildlife museum and took a walk on a trail that led us to Bishop Beach. 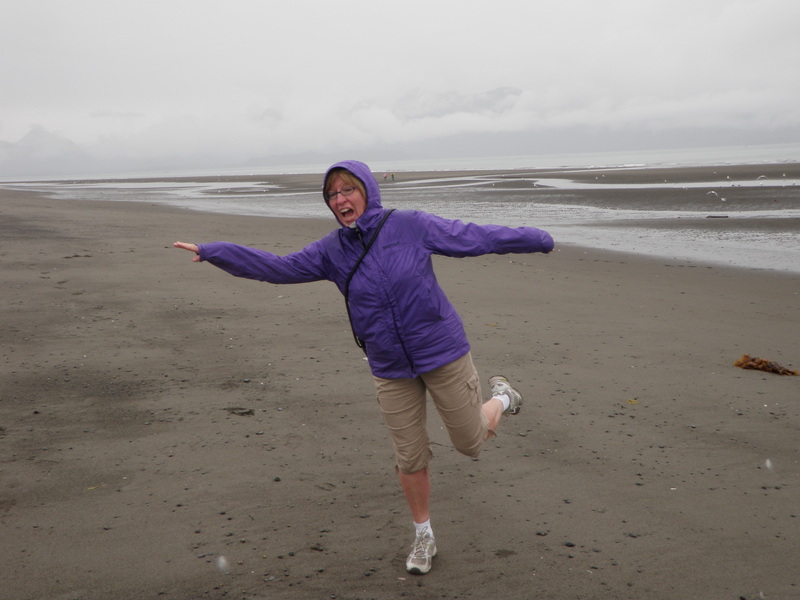 We were fascinated by the huge difference in the tides in Homer, Alaska. Cars and trucks were allowed to drive on the beach where we were and we saw tire tracks, but no vehicles shared the beach with us on Saturday afternoon. As we walked back to the car we discovered a nice little restored area of Homer with several bars and restaurants and pledged to return later. We found another hike in our Homer booklet that was east of town, and it looked like a nice intermediate distance so we drove to the trailhead. This trail was in an evergreen forest for much of the distance we traveled, but also traversed a marshy area. The trail builders had constructed a narrow boardwalk over the wetlands. The mosquitos were horrible and the weather had cleared to the point that the sun came out occasionally. The mosquitoes were really bothering us so we turned around after a mile or so and returned to the car the way we had come. We decided to return to the area we’d just left and find a place for tea and coffee, and that’s exactly what we did. We discovered a cute little deli, the type with the menu choices etched on a blackboard in artsy writing and cookies displayed in clear cookie jars on the counter begging to be eaten. We responded and purchased tea and cookies and relaxed in the small deli. As we left we walked around the block and found a bookstore with an adjoining restaurant and decided we’d like to eat our dinner there. We returned to our room and cleaned up and then returned to the Mermaid Bistro. We had not made reservations so decided to arrive early to assure seating and this worked out as planned. We were the first guests there, but the place gradually began to fill as we were eating. After dinner when we returned to our inn and walked down to the sea wall we noticed that the surf was pounding the wall and spray was flying up above it. Earlier in the afternoon there was at least fifty yards of beach visible at this same spot. 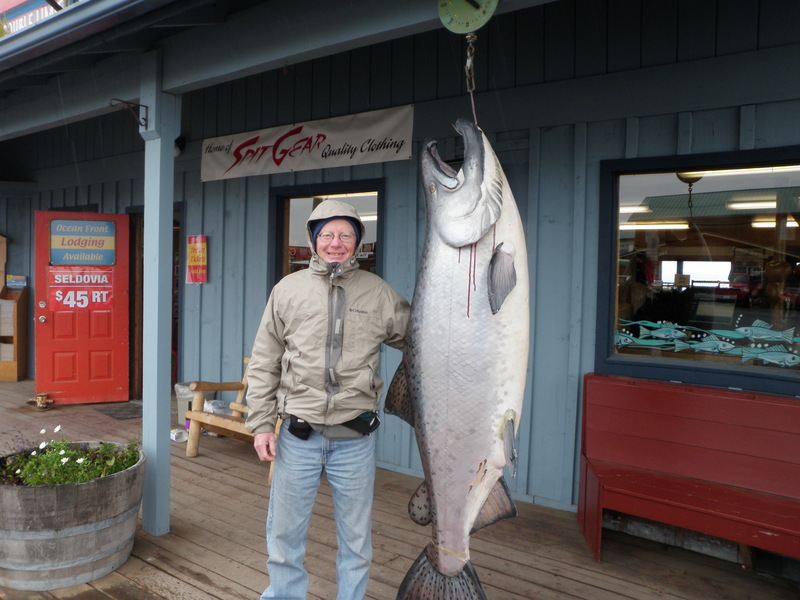 Jane booked us for two nights in Homer, AK, but we were now concerned that we would not find enough to do there for two days since we ruled out charter fishing due to the cost. 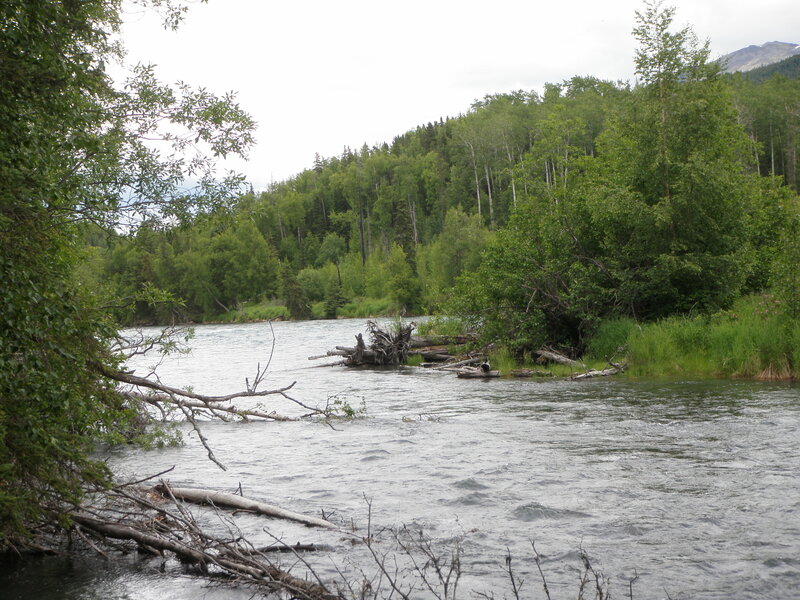 There seemed to be more we wanted to see along the Kenai River so we decided to spend most of the day along the river and then drive the remaining 100 miles or so to Homer. I found a rafting service that offered scenic floats on the Kenai out of Cooper Landing, so I called and booked an afternoon float trip. We downed our muffins and tea and coffee and headed out the door. We also read about hiking to the Russian River Falls and decided we’d like to undertake that adventure as well, so that was our first stop. We found the parking lot and paid $9 and found a parking spot in the overflow lot. It was a nice day by Alaska standards with partly cloudy skies and temperatures that probably approached the mid-60’s. Since we read that bears frequent this area to snag salmon on their upstream migration, we maintained fairly constant chatter, chants and singing. A young couple and their children from Kenai, AK caught up to us and eventually we arrived at the falls simultaneously. There was a large observation deck overlooking the falls, and we immediately noticed the pool at the base of the falls teeming with sockeye salmon. It was quite a sight. The father/husband of the family we’d met was a science teacher and fishing guide, and he told us that this was the end of the first wave of sockeye, and they migrate to the lake above the falls to spawn. 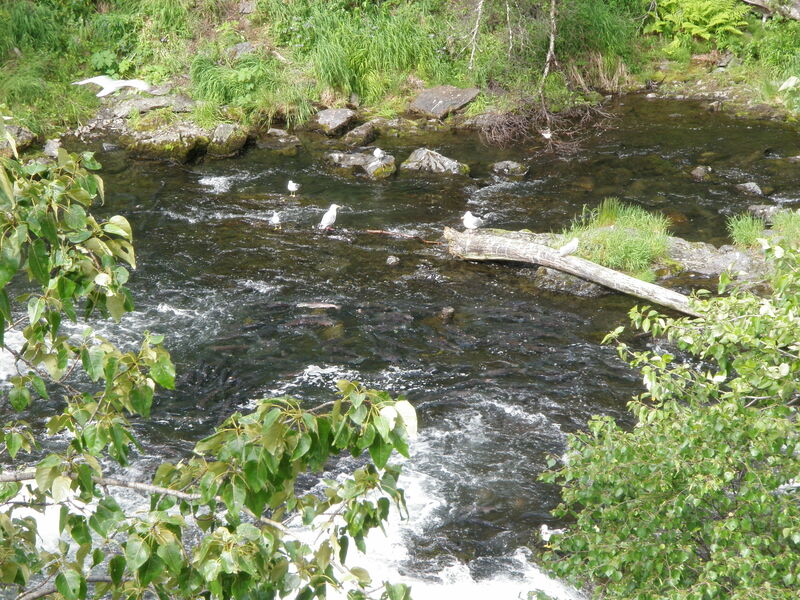 We hiked down from the platform closer to the river and found a small side channel that was just boiling with salmon. There must have been 15 fish in an area two feet wide and three feet long. We returned to the deck, and I noticed salmon leaping from the pool at the base into the frothy falls and then bouncing back. It appeared to be a rather futule venture. I captured a few of the leaps and bounce backs using the video capability of my camera. After viewing for 15 minutes or so we began the 2 mile hike back to the parking lot. 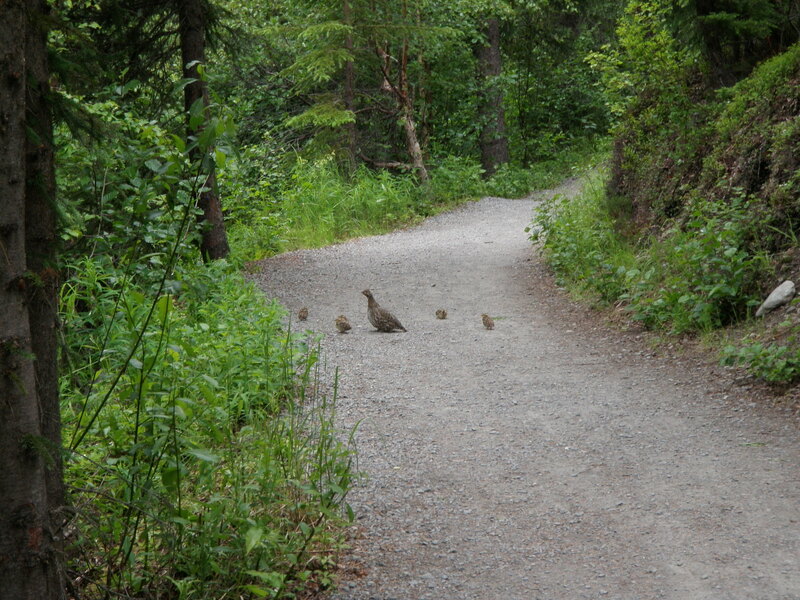 Along the way the family stopped ahead of us and motioned us to quietly join them as they’d encountered a spruce grouse and her young chicks. 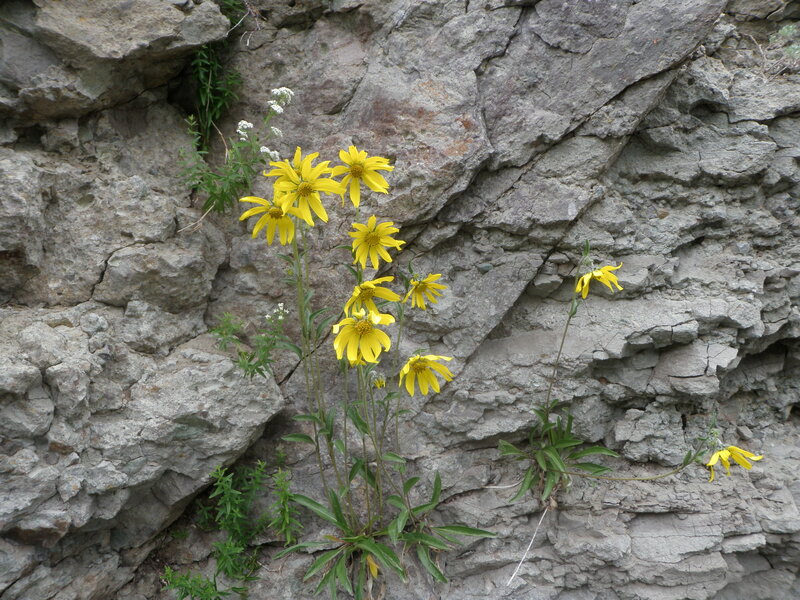 Once we returned to the car we departed the Russian River area and drove east a short distance to the rafting company. The starting point consisted of a bunch of sheds and cabins where the rafts and clothing and life jackets were stored. They served some meager snacks in the form of reindeer sausage and crackers and hot coffee, and then we put on our rubberized pants and life jackets. One of the guides ran through some safety items, although this was not a white water float and the danger was quite low. 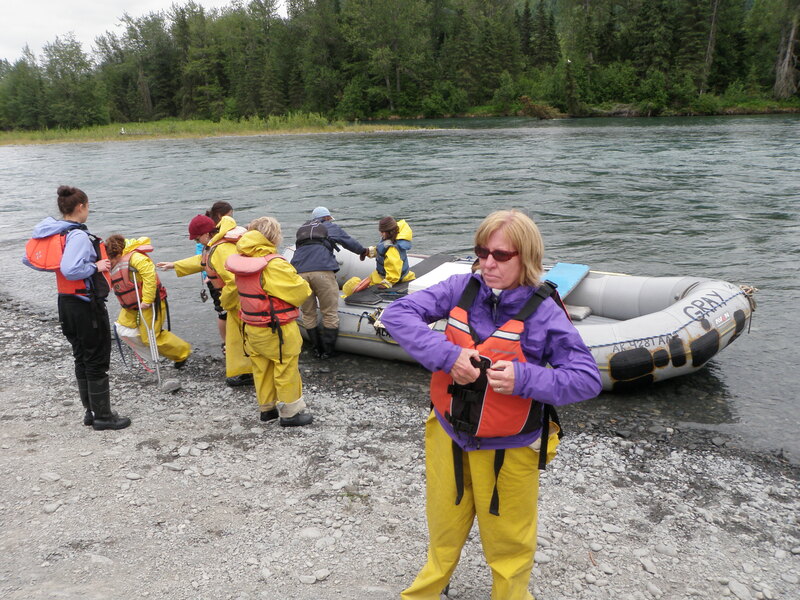 In a short amount of time our guide was pushing the inflatable raft into the aqua colored Kenai River, and we were off on our scenic float trip. Among the other raft patrons was a family from Lititz, Pa. including a grandmother, mother and three children. The grandmother was married to a guy who was a linebacker for the Philadelphia Bulldogs, a team in the USFL or some other start-up league that never got off the ground. He then played for the Pottstown Firebirds, and she said there was a movie or TV show made about the Firebirds. Also on our raft was a young lady currently attending the University of Alaska – Anchorage. 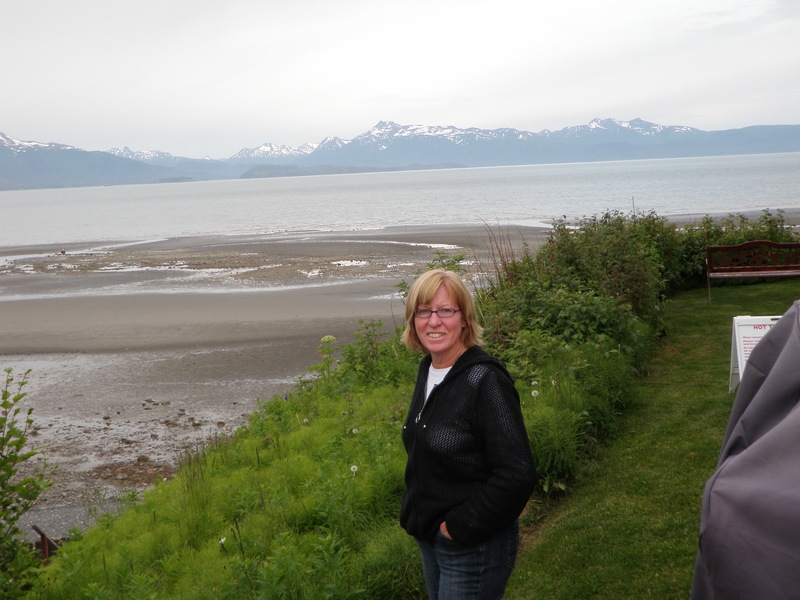 She was planning to run the Marathon Mountain race on the Fourth of July in Seward, AK and was a high school friend of our guide. Also on our raft were a couple from Oklahoma. Jane named them Debbie and Jim, a couple that are friends of ours in Denver. Their lives, speech and actions all reminded us of Debbie and Jim Eckert. The raft trip was rather uneventful other than seeing at least 15 to 20 eagles perched on the trees surrounding the river. We took out near the Russian River ferry and rode a bus back to our launch point where they had some cookies and tea and coffee. 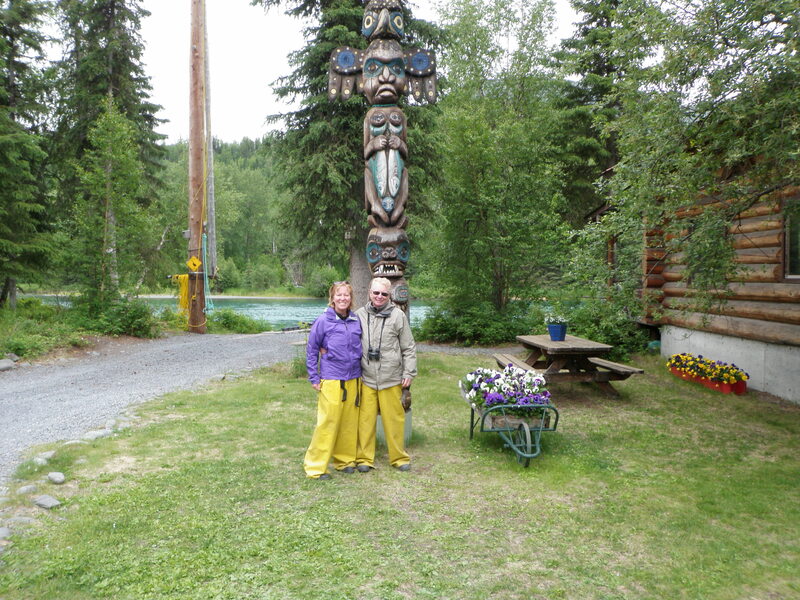 We were glad to get out of our rubberized fireman pants and set off on our trip to Homer, AK. We traveled back through the Kenai Wildlife Area and Soldotna and headed south along the coast to Homer. 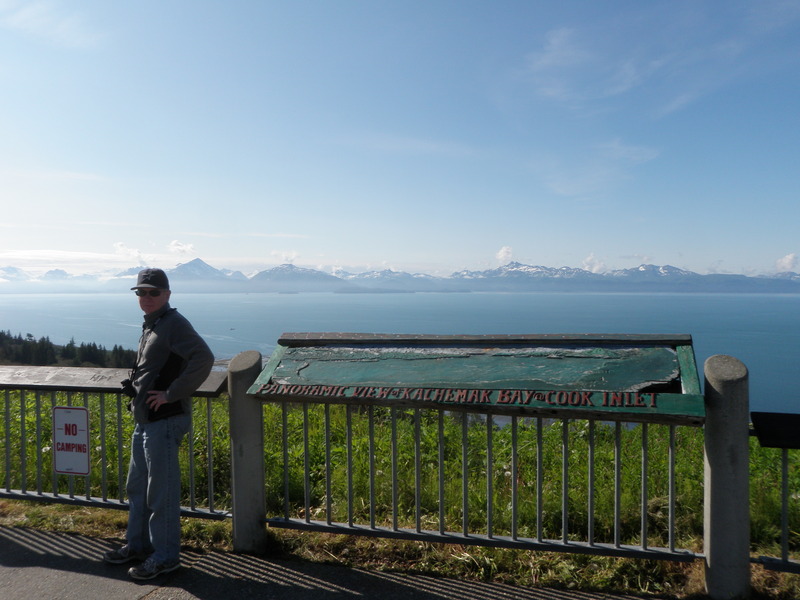 This was a pretty drive with numerous views of the mountain range on the western side of Cook Inlet. It was Friday of the Fourth of July weekend and we noticed numerous RV’s and boats particularly as we crossed rivers and streams draining into Cook Inlet. Just before entering Homer there was a pullout and we stopped and snapped a photo or two and then continued on into Homer. The lodge owners provided us with directions, and we found the Ocean View Inn fairly easily. Once again a key was in an envelope on the office door. Our room was on the second floor of a cute building set back a bit from a sea wall overlooking the ocean. We unloaded our suitcases and took a walk down to the sea wall. There was a metal ladder that enabled us to descend to the beach. We were hungry and the innkeepers recommended two restaurants in Homer, so we found them, but both were exceedingly busy on the Friday night of the Fourth so we used our own instincts and found a more out of the way place tucked behind a storefront along the main road running east to west through Homer. 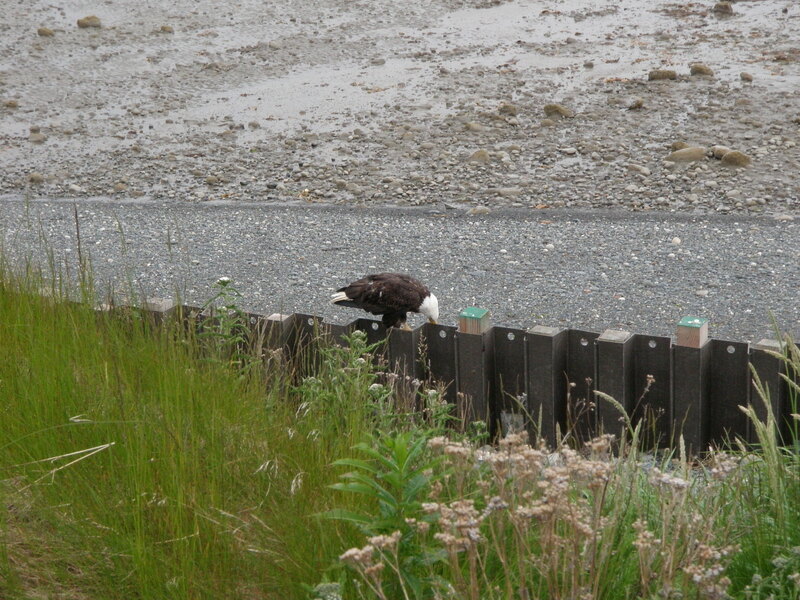 When we returned to the Ocean View Inn and walked down to the ocean we spotted an eagle perched on the sea wall. The eagle was using its beak to pull at some loose material on top of the wall which made a noise. Jane was convinced the eagle was sharpening its beak. At any rate I snapped a couple nice close photos of the national bird before it flew off.